The anthropic factor, expanding its vital area, has disrupted the natural system of existence. Over time, the evolution has been managed to meet the current needs of the human being in order to reach economic and geopolitical control of interest groups. The study is based on research into the living conditions and productivity of natural and cultivated ecosystems, as a scientific basis for plant production. The local natural environment exploited by field crops has been analyzed, focusing on species with a weight in agriculture. Romania has higher agricultural potential compared to the world's agricultural potential, but there are some which sporadically influences economic development. 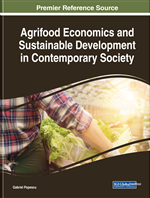 The chapter, based on rigorous analytical documentation, highlights the technological, economic, and environmental support necessary and accessible to entrepreneurs in the vegetable sector. In order to develop a sustainable farming, the chapters try to find out what types of technology are appropriate to that. The World Conservation Strategy, published in 1980 by the International Union for the Conservation of Nature and Natural Resources, included a first reference to sustainable development as a global priority (Sachs & Jeffrey, 2015). As concept, sustainable farming is farming ecologically by promoting methods and practices that are economically viable, environmentally sound and protect public health (https://www.conserve-energy-future.com/sustainable-farming-practices.php).